These lentil tacos are a 'Taco Tuesday' must try! With earthy undertones and a squeeze of fresh lime juice, they are sure to satisfy even the biggest meat eater in your family - without the meat. The lentils give these tacos a toothy feel and the mushrooms provide a ground meat-like texture. I prefer these tacos with a crunchy shell, I find because of the earthy flavors, they tend to pair better with a crunch, versus a soft tortilla, and some fresh lime juice over the top of any green of your choosing. I usually use whatever greens I have on hand, most often I opt for romaine to add some fresh leafy greens to my meal but due to the recent recall of romaine, iceberg lettuce or arugula both work in a pinch. You can also meal prep the taco mixture in advance, storing your cooking mixture in an air tight container in the fridge for 2 - 3 days. Double this recipe to serve 3 to 4 people. Lentils are a legume that come in a variety of colors and have an earthy flavor. They are extremely high in fiber, high in plant-based protein, and have almost zero fat which makes them very satisfying. Lentils have the second-highest ratio of protein per calorie of any legume, after soy beans. Lentils are a rich source of folate, vitamin B6, iron and zinc. Best of all, lentils contain all 9 of the essential amino acids your body needs and therefore are considered a complete protein. It should be noted, lentils are lower in the amino acid methionine so you will want to rely on multiple sources to get ALL your essential amino acids. 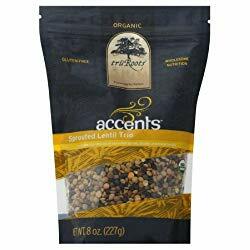 My favorite lentils are from TruRoots, who makes a sprouted lentil trio that I find versatile enough to use in a variety of dishes. However, red lentils are a great choice when making anything you want to substitute for a ground meat, such as beef or chicken, as the color and size will be similar in your end product, and would also be a great option for these tacos. I am using all organic ingredients. This serves 2. 1 tsp FoodFluent's Taco Seasoning <<< recipe! Boil water in a small stock pot. Add lentils and bring to a boil. Reduce heat and simmer 4 minutes. Remove from heat, cover with lid and let sit 2 minutes more. Strain, and set aside. 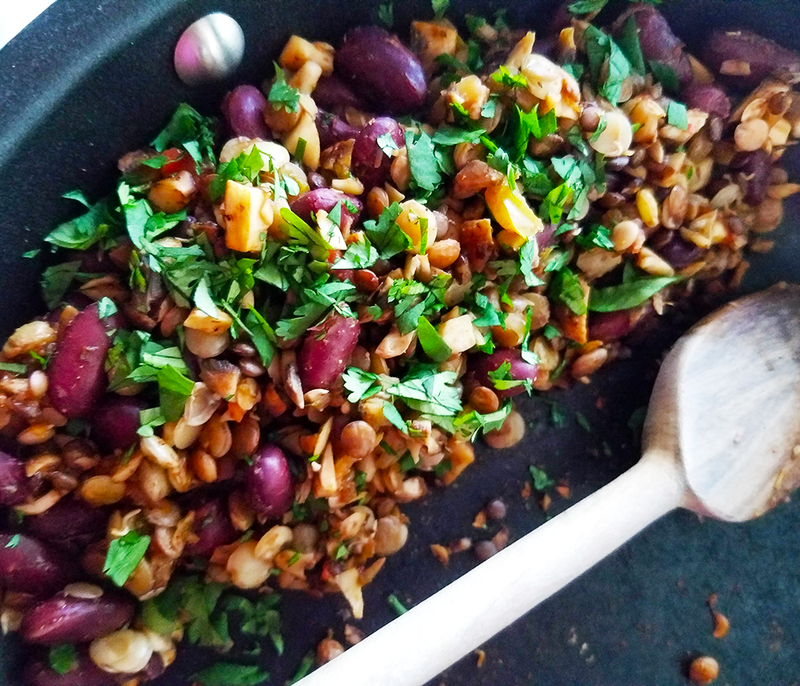 Add kidney beans and drained lentils, reduce heat to medium-low. Stir for 1 - 2 minutes to warm. Add taco seasoning and salsa, stir to combine. Remove from heat, top with fresh cilantro. 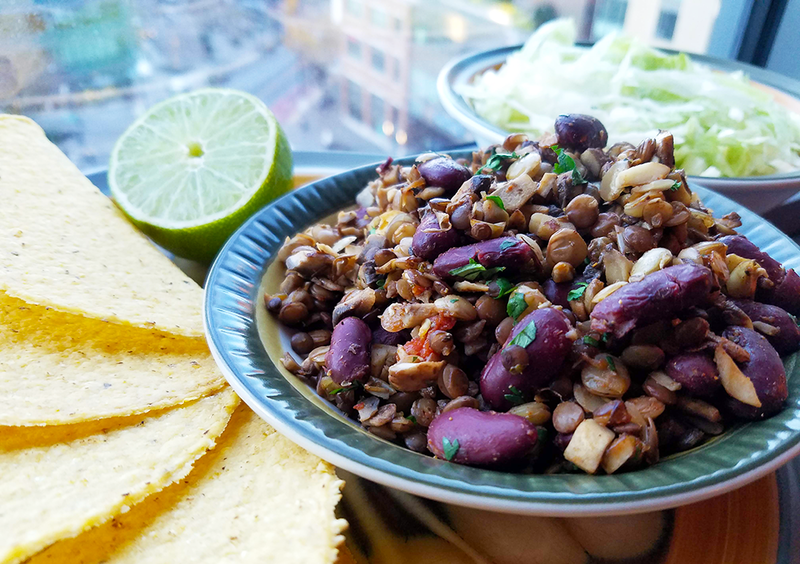 Serve lentil mix alongside fresh taco shells (I prefer crunchy for this, goes well with the lentils), shredded lettuce and lime wedges to juice over the top.